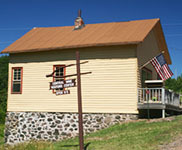 The Central Mine Visitor's Center. "Sad News From Central Mine"
When Michigan was given the western half of the Upper Peninsula in exchange for the 'Toledo Strip' as part of the deal that let Michigan become a state, no one knew of the mineral riches it held. Soon a copper rush was on and hundreds of explorers sailed to the copper country seeking their fortune in copper. In 1854 the Northwestern Mining Company of Detroit (The Northwestern Company) was in need of cash to continue mining it's lands near Eagle Harbor. Trustees decided to sell the west 320 acres of their mine site to the newly organized Central Mining Company. An ancient mining pit had been found on that land. It was common knowledge in the Keweenaw that theses ancient mines often lead to veins of copper rich rock. The new mine would border the existing Copper Falls mine on the North, the Northwestern mine on the east and south, and the Winthrop on the west. During the summer of 1855 a small group of men working under the direction of John Robinson, one of the Central stockholders, opened the ancient pit to a depth of 600 feet. They exposed a layer of trap rock or rock rich in copper below the surface. But most prophetically they discovered several large pieces of mass copper, huge pieces of almost pure, native copper. It was masses like these that would make the Central a profitable mine. They discovered masses of copper in the new shaft and hired additional men to development of another shaft some 200 feet up the hill to the north of the first shaft. The shaft work produced 83,836 pounds of copper in the first year of operation in 1855. All of the copper was hauled by wagon to Eagle Harbor where it was shipped 'below' (a phrase indicating the world that existed down the great Lakes, below the Keweenaw frontier) for smelting When the copper was sold the Central had managed to make more money from the copper it raised than it spent on expenses during its first year of operation. This was a first for any Keweenaw mine, most of whom lost money spent on developing (exploring underground for ore pockets) the mine for several years before striking any profitable lodes. The 26 miners and 20 surface workers at Central lived in homes at the Winthrop and Northwestern location during through 1855 since no homes were built at Central until 1856. By 1859 Central had 4 shafts reaching up the hill and was employing 98 men. The mine was still using the stamp mill, lumber mill, offices, school, and housing at the Northwestern mine. 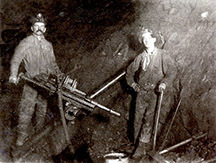 Many of the miners were immigrants from Cornwall, known as "Cousin Jacks". By 1864 they employed 240 men including 146 miners, 28 mechanics and engineers, and 64 labors. By 1867 the mine employed 268 men and for the third year in a row there had been no accidents at the mine. The town and mine continued to prosper and had a population of 950 in 1870, including 167 miners, 38 surface men, and 16 stamp men. While the Central Mine had experienced several streaks of accident free years it experienced on of the worst accidents in the Keweenaw on Monday, April 22, in 1872. Thirteen men were riding the skip car (a railroad type car that rode on rails as it went down into the mine and was primarily used for bringing copper to the surface) down the No. 2 shaft to go to work in the mine when the rope holding the skip car gave way. Most of the men involved were Cornish. A poem, Sad News From Central Mine was published in Cornwall. It not only describes the tragic events of the day in detail but also lists the names of those involved and their home towns in Cornwall. To many miners at this time Central was not 'home' but only a 'foreign land' from which the miner hoped to eventually leave and return to home and those he loved and missed. The copper was beginning to run out as the mine went deeper. Fewer and fewer large masses were being found and it was these masses which made fissure mines profitable. Production in 1881 was less than 1880 and Central employed only 206 men. New power drills and a Rand Compressor were brought in to make underground work more productive with fewer men but production continued to decline each year. Central was the only mine in Keweenaw County to pay a dividend in 1882. A record amount of 2,512,886 pounds of copper was produced yet due to expenses at the mine only $40,000 in dividends were paid. Central installed a second man engine, this one at the No. 2 shaft 1886 but the fissure copper was running out. James P. Edwards, the Commissioner of Mineral Statistics for the State of called the Central "The Last of the Mohicans" in 1892 for its place as the last remaining fissure mine in the state. 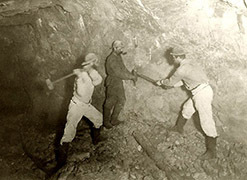 On August 1, 1894 work was suspended at the mine and a small underground force was kept on the payroll to continue to explore for new, copper rich ground in the mine. The exploration for a new source of copper underground was not successful and little copper was mined from 1895 through 1898. The end came for Central when the mine was closed on July 20, 1898. With no pumps running the water rose rapidly and sealed the openings where so much copper had been taken from the earth. The stamp mill continued to run until August 6, 1898 to stamp the rock on hand. In 1905 the Calumet and Hecla Mining Company purchased the land but C&H never reopened the mine. Now only the sound of rock hounds and their metal detectors running over the old poor rick piles are the only mining done at Central Mine.